Happy Flag Day! 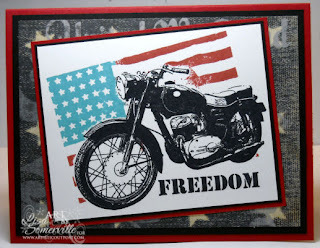 While browsing through the sale ads in today's paper, I came across a T-shirt that had a flag image behind a motorcycle and thought that the She-roe and Route 66 images from Artistic Outpost would work create for a card with a similar look. I stamped the motorcycle in Black Archival from the Route 66 plate and masked it, then inked the flag from She-roes with Broken China and Aged Mahogany and stamped over the mask. The sentiment from She-roes is stamped in Black using a SAMJ. The DSP is from Karen Foster available at ISC. Don't forget you can save 10% on all purchases from Artistic Outpost when you use code LS-10off at checkout. That looks fabulous together!!! Great card. You clever girl!!! This is AWESOME! !